Guys. I don’t want to jinx it, but I think Fall might actually be here to stay. We’ve had the A/C off and the windows open for the better part of a week now. The leaves are starting to turn colors and the chickens are slowing down their laying (a sure sign that the days are getting shorter). I know Fall is everyone’s favorite season, but I’m actually an equal-opportunity season lover—hence why I live in a place that gets all four of ’em. Although, I have to admit, I am particularly jazzed for the cooler temps this year. Summer is wonderful—and if I had to pick, I’d say I’m a summer girl—but I’m about half past over the bugs and poison ivy and humidity. It was a good run, sunshine and warm weather, but I’m ready to wear my scarves and boots full-time, k? Another sure sign that Fall is here in our house? Hockey season has started (well pre-season anyway)! I know everyone’s all jazzed about football, and we’ve been watching our fair share of the gridiron, too, but we’re definitely more of a hockey (and college basketball) household. This probably comes as no surprise, considering my husband is Canadian (he’s actually from the city with the highest number of NHL players per capita—it’s kinda in the water there). I never got into hockey until we were married, but it was love at first watch! I love watching sports for lots of reasons, but I think the ritual of being a sports fan is my favorite part—to me, there is just something so inherently cozy about curling up to a hockey or football or basketball game on a Saturday night. A lot of it is how I grew up—we were a sports-watching family, so a lot of my best memories are huddled in a room with my parents and siblings cheering on our teams—but I think a big part of it is also the predictability of it all. There aren’t a lot of things I can say are a given in my life—you never know what is going to happen—but I am pretty certain I can predict that each Fall, I’m going to be able to turn on a football or hockey game (unless there is the whole pesky strike thing going on). I take a lot of comfort in that predictability. And, of course, good cozy food goes hand-in-hand with hockey (or football) watching. 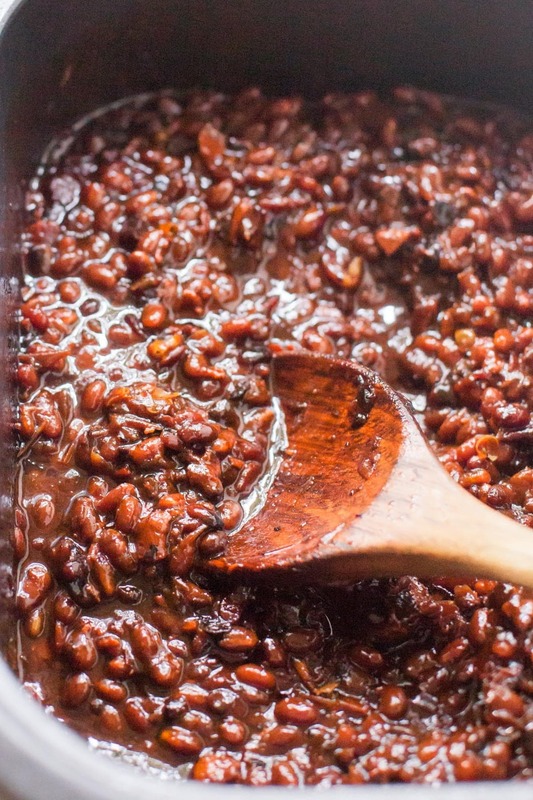 Now, I know baked beans aren’t typically considered a game day staple—and most folks even think of them as a side dish—but to me, baked beans are everything that a good, hearty game day food should be. They are easy and affordable to make for a large crowd of sports fans. They are comforting, cozy, and decadent (especially with all that bacon). And my favorite part—the slow cooker is absolutely the perfect tool for cooking baked beans. I mean, I’m a big believer that you can cook almost anything in a slow cooker, but baked beans are a case where you really shouldn’t use anything but a slow cooker. It’s the right tool for the job. Also, this recipe calls for Navy beans, but you could sub in other beans. If you choose to use kidney beans, make sure to bring them to a full, rolling boil on the stovetop for 10 minutes before adding them to the slow cooker. 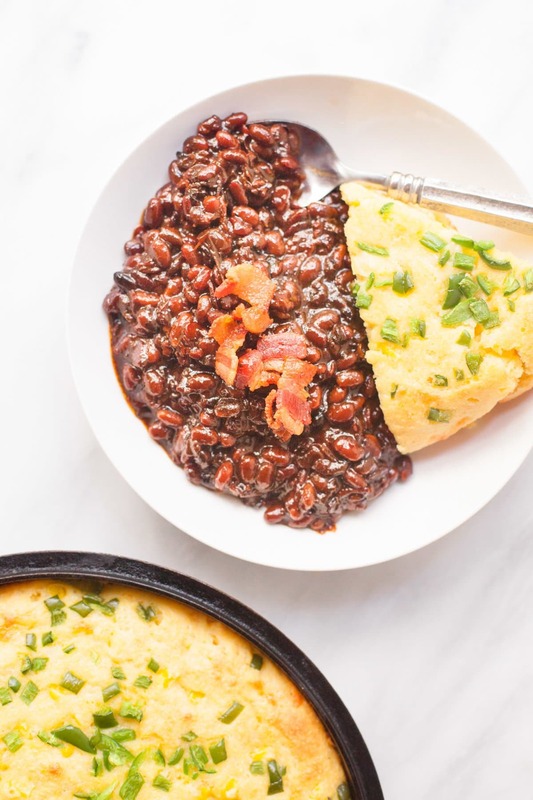 Most slow cookers do not get hot enough to safely cook kidney beans—they have a toxin in them that can make some folks feel pretty yucky if not cooked at high enough temps. 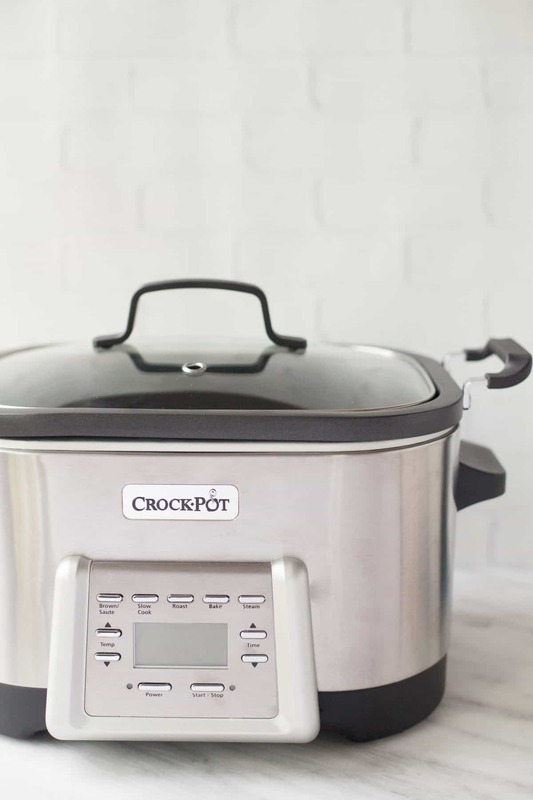 Worth noting, the Crock-Pot® 5-in-1 Multi-Cooker I use (and looovveee!) has a sauté setting that gets hot enough to bring dishes to a full rolling boil. So if you’re using this slow cooker, you’re fine to use kidney beans! 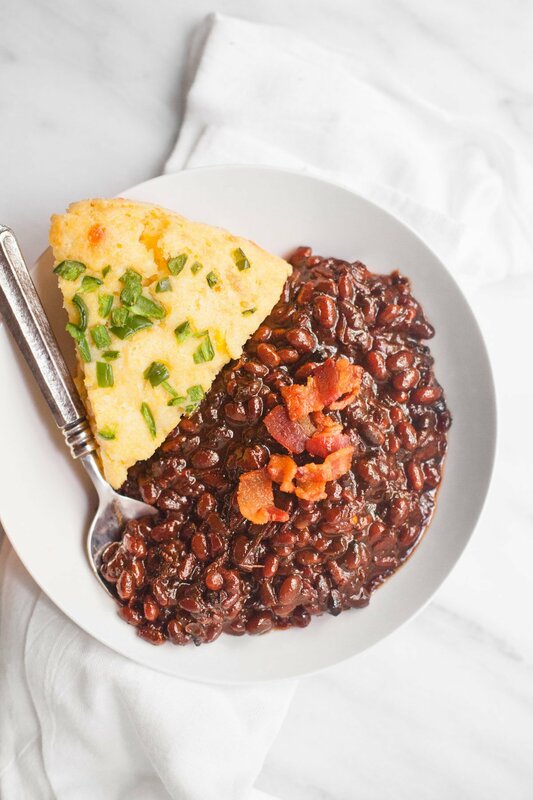 We served up these beans with a batch of the Jalapeño–Cheddar Cornbread that’s in my first cookbook. Enjoy! 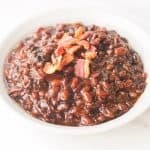 Slow Cooker Bacon Brown Sugar Baked Beans are a cozy and decadent way to please a crowd on game day. Soak the beans in water (the water should rise a few inches above the beans) overnight. 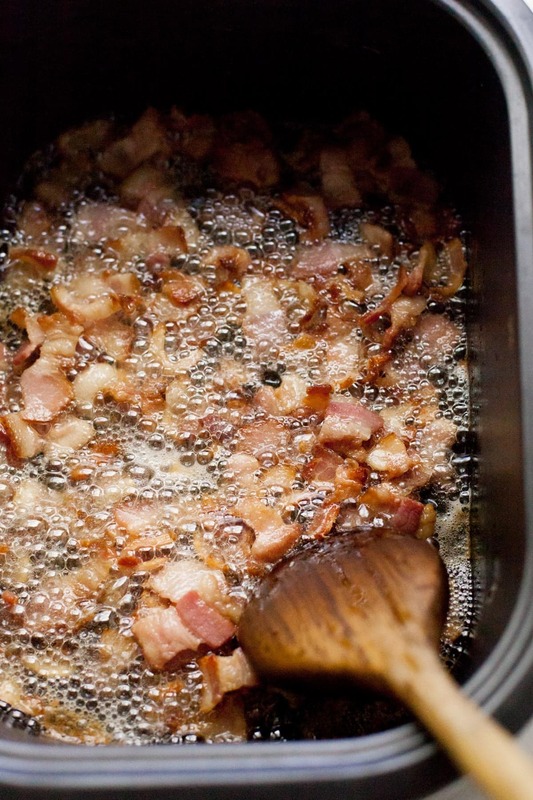 Cook the bacon on the sauté setting of the slow cooker, or in a Dutch oven on the stovetop. Remove the bacon and set it aside. Drain all but 2 tablespoons of the bacon grease. Sauté the onion, pepper, and garlic in the grease until soft, about 5-7 minutes. If you cooked them in a Dutch oven, transfer the vegetables to the slow cooker. Drain the beans. Add the beans and 3 cups of fresh water to the slow cooker. Cook on high for 3-4 hours, or until the beans are mostly tender. Whisk the brown sugar, barbecue sauce, vinegar, mustard, and molasses together in a small bowl. Stir into the beans. Add the bacon to the slow cooker. Cook an additional 1-2 hours on high, until the beans are thick and dark. This is a sponsored post written by me on behalf of Crock-Pot® brand. All opinions are entirely my own. 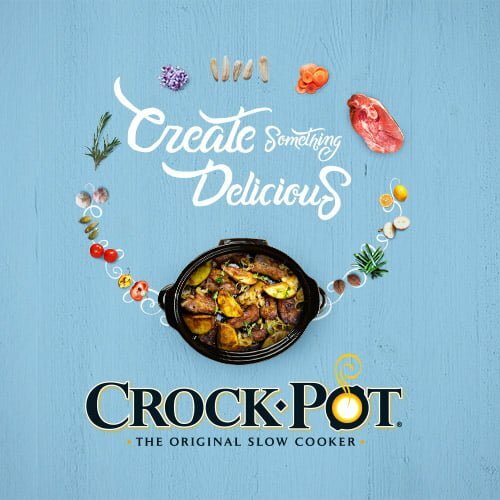 Don't forget to visit the Crock-Pot® brand website to see all of their delicious slow cooker recipes! Oh my gosh….it’s not even 8 am and I want those in a bowl in front of me right now! Also, your quote about hockey players from your husband’s hometown makes me think he’s from Thunder Bay. 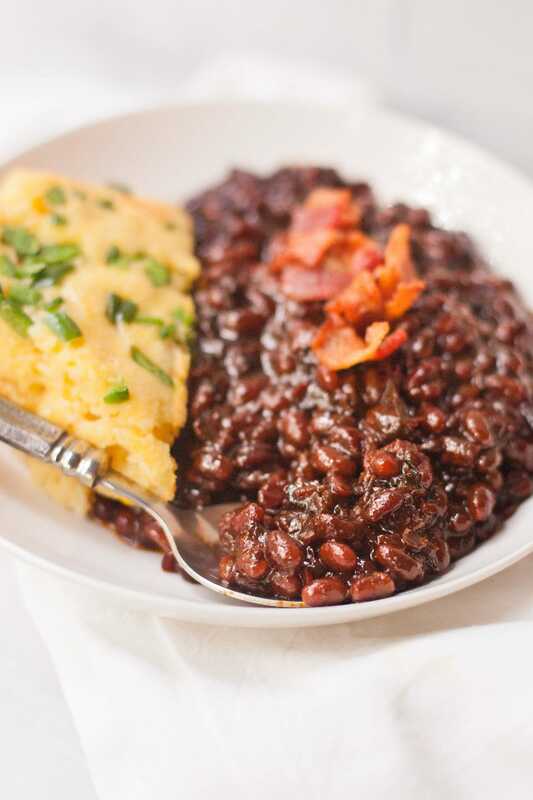 opps…forgot to mention this bean dish looks soo delicious! I’m trying it soon! Made these beans for dinner tonight……totally yummy! Love the sweet and the tang! And BACON! 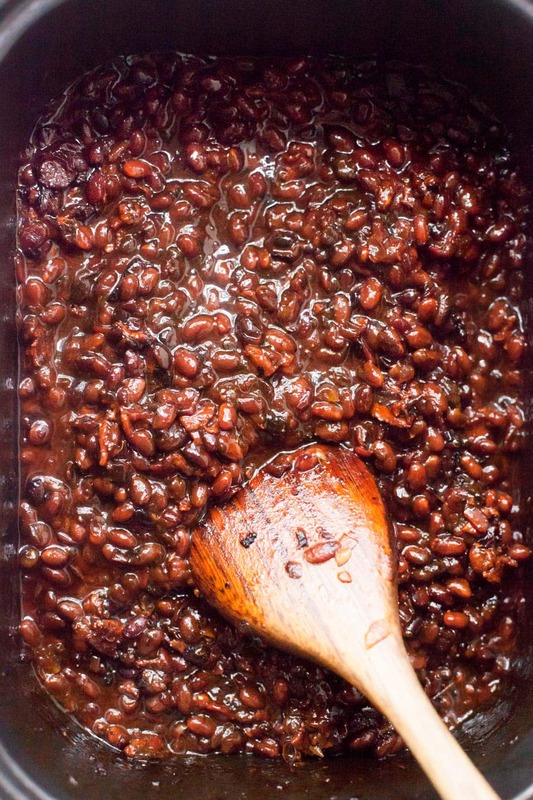 Mine took a few more hours to cook….used couple year old Anasazi Beans…..but hey…it worked! He thinks I made enough for an army…..I/it did, but that is what my freezer is for! Will be pulling out a bag now and then and enjoying them with our meal thanks to you! Your crock pot is pretty darn nifty …..I fear my older than dirt one is never going to die! I haven’t made the beans yet, too hot right now. But I want to thank you for info on toxins in kidney beans. Twice I have been violently ill after eating chili w/ kidney beans. Could never understand why. Thanks! Hi, making these baked beans for first time, and wondering if you leave the liquid left over from the additional 3 cups water in the crockpot, or if you remove some of it before adding the sauce, bacon and sautéed veggies? Can’t wait till dinner! Amazing recipe! My 9 year old LOVES baked beans and I wanted to make them at home instead of serving him the gross canned version from the store. I’m an ingredient reader and opted to use 1/2 cup honey instead of brown sugar. My son says they are THE BEST baked beans he’s ever had, so sweet, and wants to eat them every day!! Can I replace bacon with ham in this recipe? I haven’t tried it, but I think it would work! You might need to add a little oil in step 3, if you don’t have enough fat in the pan for sauteeing.